Clever Magazine, Summer 2019 " New Century Dictionary "
Who actually reads or needs a dictionary these days? Right? If we have to define a word, we Google it. Just grab the iphone. Get rid of those heavy volumes cluttering up the bookshelves or the high-value real estate on your personal desk. Dictionaries are a thing of the past. I was chatting with a friend who is a volunteer at her local library. She says they just toss dictionaries into the recycle bin. They don't even put them out for the library sale, where you can buy bags of books for $5. Nobody wants an old dictionary these days. Remember when it was a good idea to give the grad a dictionary if he or she was going off to college in the fall? That gift has had its day. Nobody wants one, even as a graduation present. So let's say you want to know the precise definition of a word. Take, for example, the word "lickspittle". Most of us probably have a vague idea what it means. My definition is simply "toady." Google is a hurry-up online dictionary, synonyms only. Keep it short. No quotes, no hints about how to use the word. So as it happens, I'm the owner of a New Century Dictionary, in two volumes, very heavy. A friend found it in a flea market, bought it for $1, and gave it to me. She knew I would like it for collages. I do use it for art projects. I tear out pages and use them in collages, so many pages are gone. Lickspittle n. An abject toady; as, "averring that they were a parcel of sneaks, a set of lick-spittles" (Thackeray's "Newcomes" xvii). The New Century dictionary is just brimming with information. Here's a nearly page-long definition of the word Wrong. It runs on longer than this illustration, but you get the idea. A person can sit down with this dictionary and be amused for hours. I have been sidetracked by my New Century Dictionary for years now. I bring it out when I'm looking for a lovely little illustration to rip out for a collage, or a whole page with no images on it for background purposes. Then I start glancing at the definitions. Soon I'm engrossed. The most erudite, knowledgeable, charming book ever. Lots of the definitions contain references to the classics, or Shakespeare, or even the bible, to further explain the word they are defining. Who does that any more, I wonder. I also wonder about the lexicologists who actually wrote this dictionary. How on earth did they do it? My volumes are a later printing (1948) of the 1927 version. In 1927 there were no computers, no google, no easy way to find all the quotes they used. They had to either know the classics by heart or have the references nearby. Perhaps somebody had put together some handy guides for them, like Roget and Bartlett, but still, imagine the amount of work they must have gone through to come up with these delicious definitions. 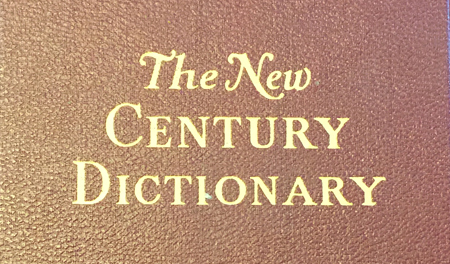 According to Wikipedia, the New Century Dictionary was first published in 1927 and reprinted for over 55 years. It was admired for the quality of its entries, and the craftsmanship in design, typography, binding and illustrations. The OED cited it over 2,000 times. So there you have it. An excellent product, treasured for years, but now it goes off to the trash without a whimper. What a sad day for us. However, there is hope. If you want one, the 1948 reprint is selling on Amazon, used, from between $19 and $50, depending on condition. I can't help but wonder if anybody will ever buy one. A side note: When you go to google, you might find reference to the Urban Dictionary. You really should spend some time with it. It's a dictionary with a sense of humor. BTW, FYI: the most recent and well known use of the word Lickspittle was used to describe Pence.